So I really don't do that much decorating for Easter. I try to put something pretty on my front door and pepper a few bunnies about, but other than that, eh, I usually don't get around to it. Last year, motivated by all the creativity I see on online, I made a sweet carrot garland and this year, this week actually, I whipped up another super easy banner for my hood. 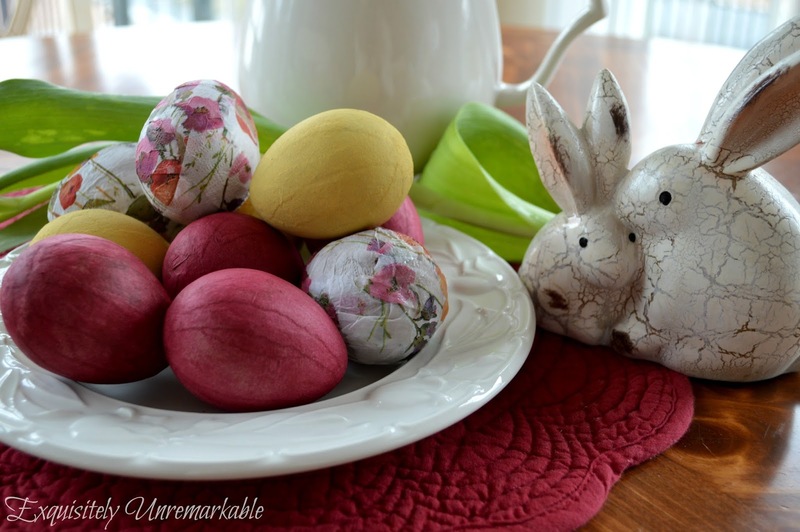 I was so pleased with it, I decided to raise the bar just a little bit higher and try some of those pretty napkin Easter eggs that have been featured everywhere lately. I figured, how hard could they be? Well, let me tell you...too hard for me, that's for sure. No, let me correct myself. They were not too hard, just way too labor intensive and time consuming for this hit and run craft girl. I started with a few paper mache eggs from the craft store. It meant that I wasn't going to be able to cut the flowers out individually and add them to my brown egg for that sweet dainty look I adore, but I wanted decorative eggs with staying power and I was not blowing out any yolks, so I went with faux...they were on sale, too, less than a dollar a pack. I picked up two packages of pretty napkins from the clearance aisle, as well. 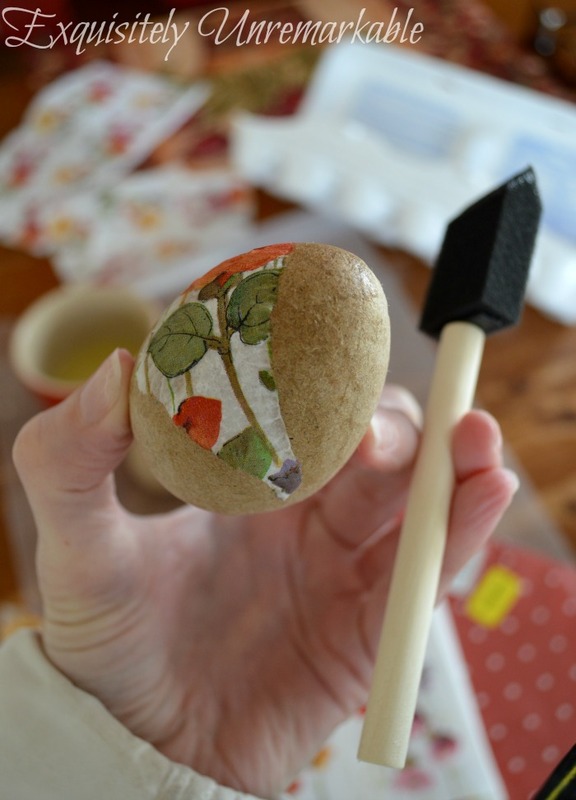 I was going to use decoupage paste/ gel, but I don't always like the smell. Several websites suggested using an egg white as your medium, so I went with that. It all started out rather well. I just brushed the egg white onto the egg, tore some paper strips from the napkin and went over the top with more egg white. So far, the process was very uneventful. Ok, now before we continue I would like to point something out here. Do you see the white cuff? I am wearing my coat. Yes, that is my jacket. When I say that I like projects that are super quick and easy, I am not kidding. You see, I craft when I can...very little bits of time, in between carpooling kids to and fro, running errands, cleaning, laundry, cooking, etc. This is how I really, truly work. If I can't accomplish it in a jiffy, it's not happening. 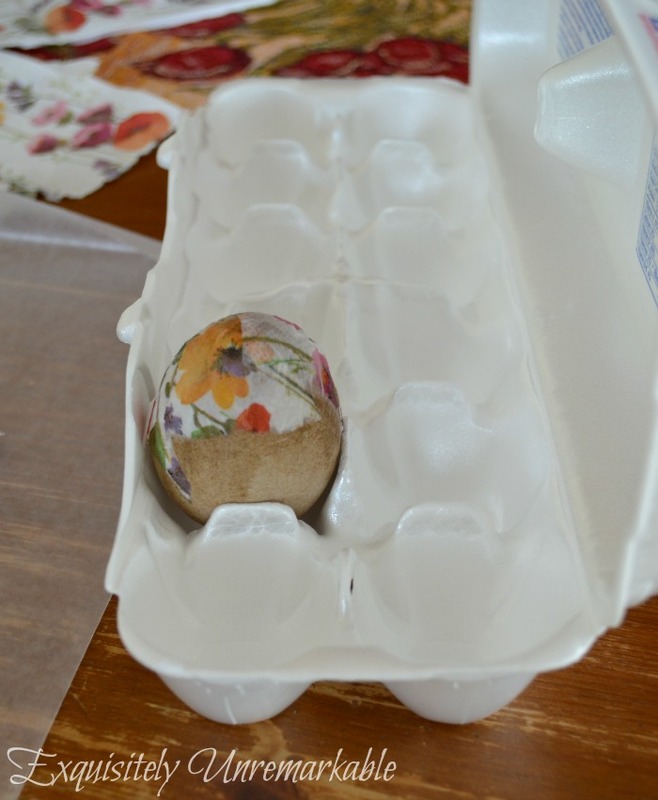 I covered about half the egg with paper and then set it in the egg carton to dry and started on another egg. Again, so far, so good. I made three of the flowered pattern and then moved on to the polka dot napkins. Here's where the trouble began. 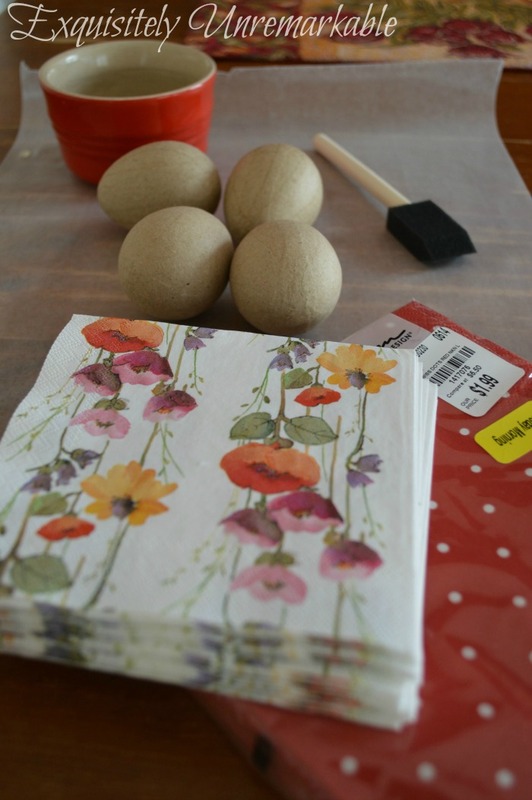 The floral napkins were single ply, sturdy and easy to work with. The red napkins were two ply. If I tried to work with both, the top layer slipped. When I removed the bottom layer, the napkin tore when I tried to paste it on the egg, it was too thin. Also, when I tore the red napkin, it had white edges that looked terrible. I was getting frustrated and thought, ok, I will just make them all floral. Well, as they started to dry, the napkin started to peel away. I got out a hairdryer to speed the process and secure the paper with my fingers. That was ok, until some of the napkin starting coming off in my hand. Then I started wondering about the egg whites. Will it keep the paper on forever? Is someone or something going to try to snack on it over the summer when they're stored away? Will it mold? Ugh. I don't like unanswered questions, so I got out my washable school glue and started painting a layer on the eggs ~ y'know, in case. Well, that was a very messy process. Again, I brought out the hairdryer and started to dry the eggs. The paper was bubbling, my fingers were sticky and I really didn't want a bunch of uniform eggs. I like diversity. It adds interest, all one pattern is boring. By this time, I was so frustrated with the idea of decoupaging anything else, that I grabbed two of my craft paints and another foam brush. In a few super short minutes, I had a bunch of painted eggs. They were bright, dry and best of all, done. I admit it, when it comes to crafts, I am a product girl. I do not enjoy the actual doing phase, I much prefer the idea brainstorming phase and the admiring it when it's completed phase. Especially since now I have my dinner and dessert napkins for Easter brunch; that's one less errand to run. And yes. I am still wearing my coat. Oh Kim, I'm right with you when it comes to doing my own decorations too. I want simple and it to come out looking good. I'm so glad that you told me what this process was to like to make the eggs as it seemed simple. Your eggs came out looking so pretty though! I still need to get a few decorations done in my living room! I hope you have a wonderful and Happy Easter. I really like simple Julie. I just don't have patience for long, complicated, tedious projects. This one wasn't so bad, but beyond me today for sure! Your eggs look great Kim! I wish I was crafty but I am terrible at it. I just try to find really good deals that don't involve me trying to create anything! Thanks Janet! Yes, there are certain things I won't even attempt...and then I am looking for a deal, too! Even with all the trial and frustration they came out looking cute. Happy Easter. Thank you, Kris. They do look pretty as I sit here in the kitchen looking at them…but I’m glad I’m done with that project! ;) Happy Easter to you too! You sound like me as far as quick and easy. I think they turned out beautiful though. I have not heard about egg whites, but then I tend to try things without directions and you know how that turns out. I really didn’t research the egg white idea, Barbara. 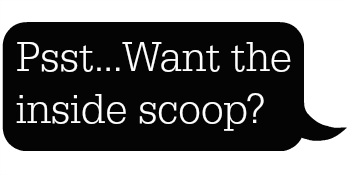 I read about it on several websites and ran with it…not a good idea! ;) Thanks for popping by! I was laughing, Kim. They really look cute, despite the difficulties. When I'm crafting, I have a lot of misses. Because I get an idea, and I try to work with what I have in the house. So as I was reading this, thinking I would try it, I thought: I don't have decoupage, so I will just dilute glue. I have cloth... Well, sometimes my projects don't turn out right. 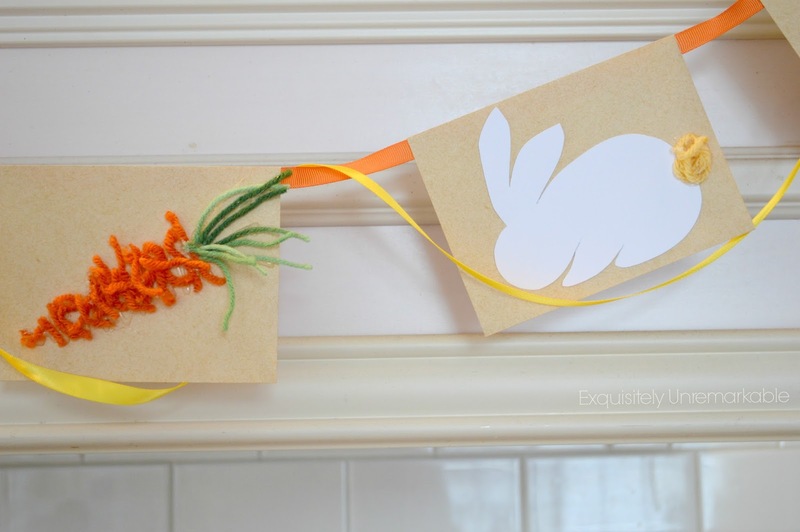 I really love the bunny banner that you made for your kitchen. They sure turned out pretty, though! Your efforts were not in vain, dear Kim. They're lovely! Hahaha what a funny story Kim! Glad it worked out in the end, at least you went to the trouble of trying the napkins out! I'm lazy with Easter, Have never painted or decorated any eggs before! All your Easter decor is very pretty, Kim. I love your banner, with the bunnies and carrots, and those yarn critters are actually pretty cute! I would have seen a big, red stop sign at the thought of using egg whites as glue, for all the scary reasons you mentioned, too. I feel your pain. They are really cute though! These are really neat and what a great way for children with egg allergies to get to participate in the egg decorating tradition! That is very true, Mandee. If you substitute my egg white glue for real glue, it would be a super way to include everyone in the festivities! You win some and lose some, that is my go-to motto at times Kim! Maybe they are not what you thought they would be, but they have their own beauty regardless! It is nice to hear the real deal behind the pretty faces that you see on pinterest. I would rather someone share the raw truth of an experience with me, to save me the headache myself, rather than parroting on how easy and fun it was, when it really was a nightmare, lol! So, I like your honesty, because that way when you say something is fun, easy, and cute... I'll just take you up on it ... and go for it, lol! Have a blessed and wonderful day! The eggs were a messy job…I tried to blow them out once many years ago. I got a mouthful of raw egg and gave up. Bleck. 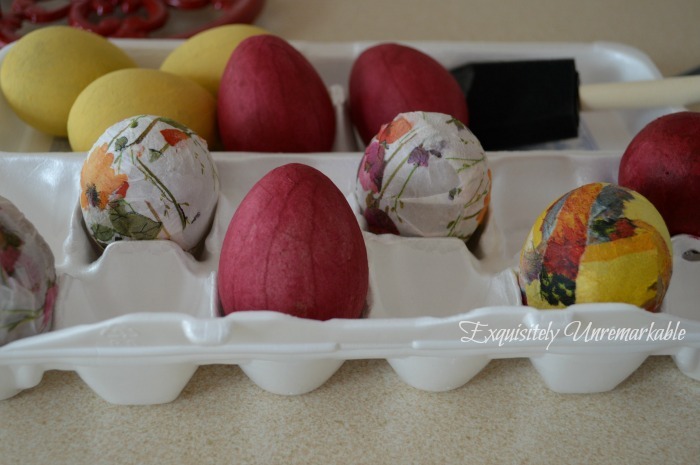 Your Easter napkin eggs turned out just beautifully! And those little white rabbits are adorable, very cute! 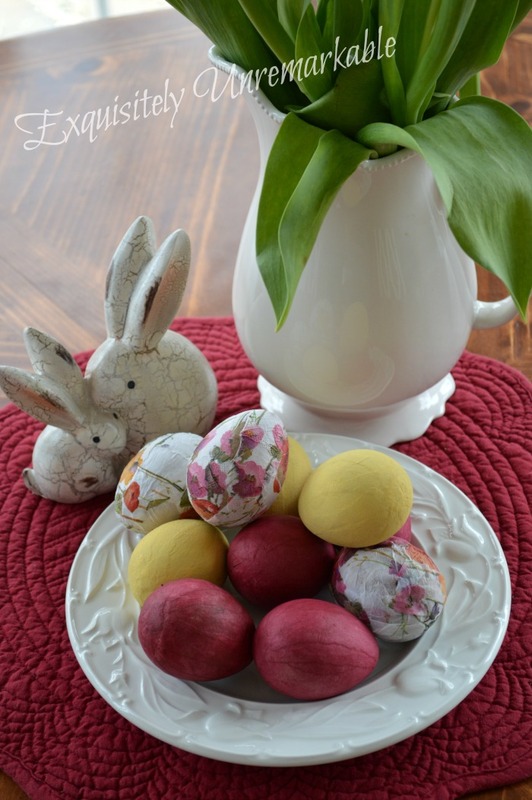 Thanks so much for your recent visit to my Easter Vignettes and Collections post. I used napkins and modge podge to decorate too! Lovely! I bet your project was much more successful than mine! ;) Thanks so much for the visit! Your eggs are adorable. Here, we aren't decorating for Easter because we have no one visiting and I still can't do any crafts. 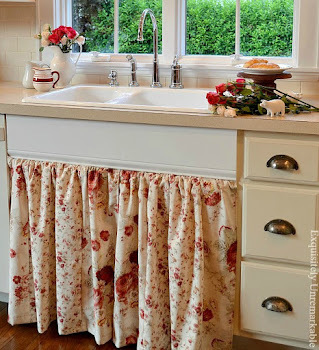 I loved seeing your feature at Junk Chic Cottage! Stopped by from Kris's to say "hello".....your eggs turned out great after all that trouble! Wishing you a Happy Easter! Well, the end result was worth all the trouble! lol! They turned out really cute Kim! Thanks for sharing them with SYC. 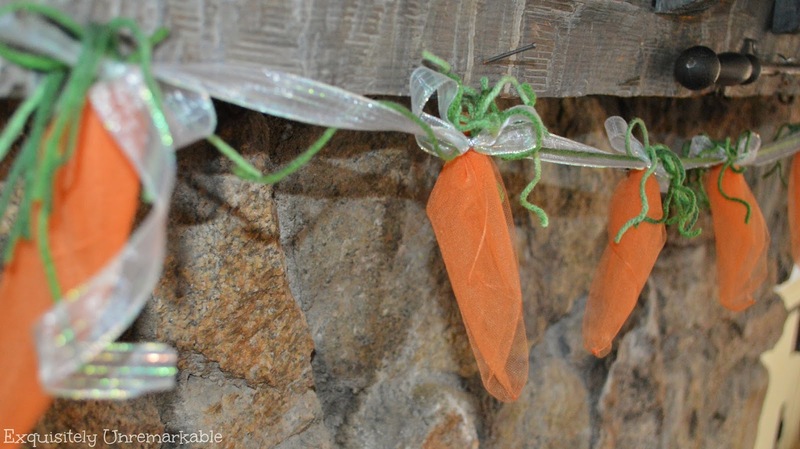 I can totally relate to why you don't want to spend a bunch of time crafting for a seasonal decoration. I think your eggs look very nice and to be perfectly honest with you I have never tried any egg craft before. But your idea looks the most appealing because of its simplicity. Super cute! Love the eggs! Thanks for joining Home Sweet Home! You made me feel so good to know I'm not the only one who loves the creating the brainstorm and results better than the deed :) Your results were just beautiful. Ha ha, I don't like long involved crafts either, thanks for the heads up! Painting is the way to go! I'm sorry this didn't work well for you! The best made plans uh? Thanks for resurrecting this oldie but goodie and sharing with TOHOT! Kim- thank goodness for your honesty! I love your solution, and they the painted eggs are wonderful, but you also shared the cons of your original plan. Thank you for that! Oh Kim! What a project! I suspect, we were all honest, we'd have to admit to some impressively disastrous fails. This one wasn't such a thing! Now, in my typical style, may I tell you the things that would have made it easier? First, skip the egg whites, for all the reasons you discovered/thought of. Second, WEAR THOSE CHEAP PLASTIC GLOVES WHEN USING GLUE AND TISSUE PAPER! It keeps the paper from paper and sticking to your fingers! The process still requires a light touch, but the end results are wonderful. This project reminds me that I need to make a tutorial on making tissue paper 'stained glass'... Always something, huh? Thanks for the reminder, and for the good laughs! p.s. I sew standing up for the same reason you craft in short spurts: it gets done! Great tips, Nancy! Thank you so much for sharing. I would love to attempt this again someday when I have more time...and a pair of gloves! ;) Please share your stained glass tutorial. That sounds very interesting and creative! I don't do many crafts and there's a reason I paint furniture.😄 I love how you shared your craft reality. Linda, your tips are fabulous and I really appreciate them. I have wanted to give this another go and with a few tips that I have received from generous readers since my first go around, I think I could fare better this time! I really appreciate the time you took to detail all the steps and yes...meringue is a better use for those egg whites!! I think I need a tutorial for that now, too!! ;) Thanks for the visit!